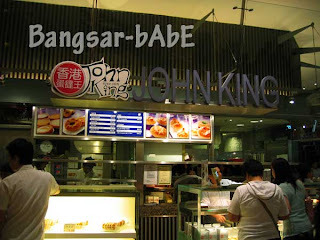 rif and I were in Pavilion (again) to pick up some things and decided to buy some John King Egg Tart. Originally from Hong Kong, they have a few flavours – original, milk, durian, corn, green tea, red bean and coffee. All of the egg tarts are lard-free. 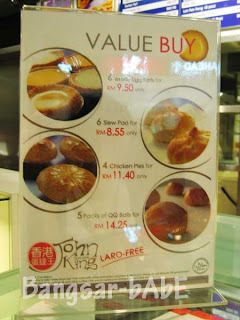 o_0 Bought half a dozen for RM9.50. 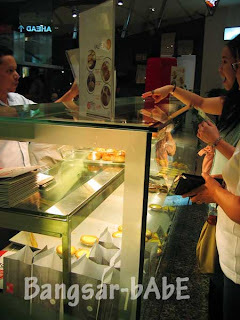 We selected 2 original (pastry crust), one milk egg tart, one green tea, one durian and one corn egg tart (all cookie crust). The pastry crust was flaky and light. The cookie crust was soft and crumbly. Of the two, I prefer the former. The egg fillings had a very soft, tofu-like texture that’s not too sweet and melts in your mouth. I liked the original and milk flavour the most. The corn was alright; it tasted like normal egg tart with corn bits inside. I didn’t like the coffee and green tea flavour. I thought they tasted weird. i agree.. tong kee is certainly nicer. i think that the egg filling is TOO soft, almost water like.